I spy with my little eye... a burgundy vintage Hat. I've always loved Hats and regretted their slow disappearance from our wardrobes. If you think about it, wearing a Hat helps a lot with bearing, and holding your head straight. During the 2nd world war, when hats were the last thing on women' mind and shopping list, they learned to manage without. Instead, they developed new hairdos, that's how pin curls and victory rolls appeared. Interesting how history influenced fashion. I love those vintage little stories and treasures. I started collecting Hats a few years ago and I cherish each one of them. They come from everywhere: Paris, London, Melbourne, Amsterdam... And I like to take them out. So yesterday, my burgundy Hat met Jimmy Choo and Fashion TV. Playing with Jimmy Choo's 1920's clutches. Catching up with talented Farah from Dresscode by Farah. Partying with Fashion TV and stylist Ushi. I spy with my little eye... a vintage Gem in Dubai. A real vintage gem. In Dubai. Can you feel the excitment? I can barely believe it myself. I wasn't prepared for what I found when I pushed the door of this random Jumeirah villa: 40 years of worldwide thriftshopping! Lynda inherited her sense of style from her grandmother who taught her to put on her gloves, lipstick and fur even if it was just to go buy bread round the corner. "She would take out all of the china even if it was just the both of us having tea at home". And Lynda has become the Lady her grandmother was: she hosted us with tea, home-made Scones and Victoria Sponge Cakes. Once a month she opens the doors of her home to whoever is interested in vintage. The first floor salon is dedicated to her treasures from the 1920's till the 1950's. What struck me is that everything was in amazing condition. She knows vintage. Everything she bought during these years traveling the world was carefully selected. She has an impressive collection of brooches and rings, lots of scarves, a few hats and bags. I have to thank my friend N. for without her I would still be there. I might have moved in with Lynda if N. hadn't gently pull me away. Lynda decided to start selling her collection recently so if you are interested, don't hesitate to ask, I'll be happy to give you her details. Look at that wallpaper. Could it be prettier? Pretty brooches for the hair or the jacket. Definitively my kind of tea time! My hair is a recurrent subject on HOB because it is a recurrent subject in my life. The war never ends. Sometimes I win a battle, for example when I cut my own fringe with a razor. Sometime my hair does. I love it, but it clearly hates me, not my fault! It's curly (loves humidity, obviously) and refuses to grow (hi untamable baby hair! ), but, because I'm a woman, I am a contradiction, we've already established that, which means I refuse to lose my curls. No passaran keratine. 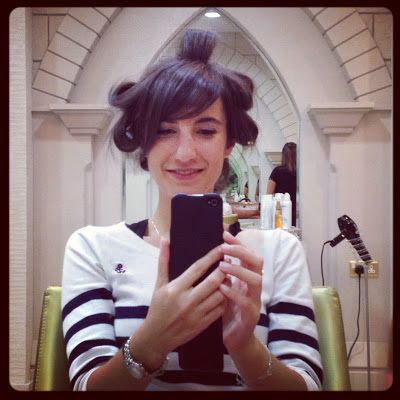 So I developed this little game of mine called "let's try hairdressers all over the world" (remember this post about my experience in Tripoli, Lybia). It took me a while but I found my hair's kindred spirit here in Dubai at Carita (remember here). Now last year was my first summer in Dubai and I literally fried my hair trying to tame the frizziness so I decided this year after all the effort, vitamins and hours spent conscientiously waiting for the masks and oils to work their magic, I thought I'd try to avoid ruining it all by getting some kind of soft treatment. It took me months to actually get to a compromise but one day I finally found the courage to make an appointment to an unknown salon for an "extenso". Little did I know I would actually run out of there with my untamed -oh so natural darling!- hair, looking like Hermione Granger because the manager thought it was a good idea to tell me the said treatment would make my hair "die inside". Probably a good thing he didn't sign up for a diplomatic carrier. So here I am, on the street with my distraught hair, feeling like I want a cuddle from my favourite hairdresser. When I got there she offered to do the treatment and because she is good at what she does, she left the product on my head only 15min as opposed to the 1hour usually required. The result? Curls but no frizziness. I can now dance all night without worrying about having to pull out a Jackson 5 look. Hair 0 / HOB 1. I've had a few feedbacks asking me to share a little bit more of my everyday, so I'm trying something new: a photo per hour. Welcome into my world. 9am: Breakie! My favourite meal of the day. Latte and home made apple muffins... with a side of dots. 12am: Make up time! As you can see, my vanity is not extensive. 2pm: Mini quiches lorraine and spinach-goat cheese quiches ready. 3pm: Meeting friends at the Marina. I love this view, can't get enough of it. 4pm: Tea time with the ladies. 6pm: Snack time with my gals. In home made we trust! Remember the out with Marc party? Just found this cute picture by Ushi on his post. High waist, victory rolls and red lipstick, that's me! Happy week-end everybody! I spy with my little eye... an intercultural Pizza. At some point, in the collection of subjects that were my studies, intercultural communication and management made an appearance. The discipline is still young but in our global world, it makes sense to prepare young business wolves to deal with other nationalities and cultures. I will never forget this model I met here in Dubai who kept asking me if I had taken a shower recently because supposedly, Frenchs don't bath. I figured if we were to stay on a prejudice basis then I would play the models-are-challenged card. This is why intercultural communication is important. When cultures meet on a plate it's called Fusion, it sells better. When I make a pizza using arabic bread instead of dough, I call it intercultural. I just think Fusion is too fancy for such a simple home-made dish. Dragon Mart is this huge chinese mall near International City in Dubai. Remember Alice's maze? Well replace the talking cards and singing flowers with filipino salespeople and chinese knick-knack and you have Dragon Mart! A lot of the people here know about it but are not bold enough to actually venture there. The first time I went I was more than grateful to have a guide. I was like a 5 year old following her mother. Too much to see, signs that don't make sense, alleys that lead to paths that lead to alleys, and my inexistent sense of orientation: perfect cocktail to get lost and die there. Luckily for me, my white rabbit knew exactly where she was going. I spy with my little eye... Marshmallows and Harley Davidson. I spy with my little eye... a sparkling Exception. I don't like sparkle. I like my lipstick to be matte, I avoid diamantes and I don't understand why some women feel the need to put glitter on their face. Technically I should hate this nailpolish, but I'm a woman, I am made of exceptions. And my exception today is called Vandalism Art 76, by Nailstation. I'm pairing disco nails with a retro 1960's long white lace skirt. Sometimes exceptions turn out pretty. I spy with my little eye... a playing dress-up Day. When I was little I used to let my Mother choose (and make... Maman I love you for all those hours you spent sewing my butterfly wings) my dress-up costumes. Through the years, I got to personify a butterfly, you got that one, a traditional Alsacian, and a lion trainer, that was probably my favourite (please note I was never a princess or a fairy, not my style)! A few years later when I got to choose on my own, I got to be Minnie Mouse, an american tourist, Wednesday Adams and Nicky Hilton (welcome into my eclectic world), a russian babushka, Edith piaf's song "La vie en Rose"... Yes I do that, I dress up as songs, it's a gift. Yesterday I was playing dress up with the stylish Ushi, and it didn't involve any crown or wing, I can feel your disappointment. Instead I got to play with the United Colours of Benetton. The brand reminds me my 90's years in Saudi. Coloured flowery leggings and big T-shirts. I'm smiling just thinking of it. The colour block trend didn't invent anything, as my grandmother used to put it: "Fashion is like a big bucket. You just keep on piling the clothes you're not wearing, when the bucket is full you turn it upside down and you have a brand new wardrobe". I'm happy to support this brand that was an early militant of tolerance. Bonjour new week! Breakfast is my favourite meal, I'm a morning person, which was often a source of desperation for the few Gentlemen that got to share my energetic dawns. I am usually up at 7am, rain or shine, and I'm not good at staying in bed. That being said, I am well mannered (and I'm not 5 years old anymore) so I don't feel the need to wake up the whole house, but I can't count the times they found me in the kitchen, sipping a cappuccino, skyping with the other side of the Earth or writing. Not very cosy but on the bright side, they often get fresh crepes, coffee and muffins! This morning it was home made Blueberry Muffins for me, how did you start your week? I spy with my little eye... a coffee with Fashion Photographer Michael Kruger. I met talented Fashion Photographer Mike Kruger by chance (and I mean it, by chance). We worked on a corporate photoshoot together. It was a first for me and getting portraits of 8 people in different locations in Dubai, in one single day, make-up, posing and driving included was not a piece of cake, but Mike was so chilled about it (and I was such a military general with the troops) that not only did we wrap the whole thing but we also managed to have fun (and lunch!). He is very sharp and efficient, if he doesn't get what he wants from the model, he'll try something else. I like down-to-earth people. Remember? Common is the new black. A big Merci to him for taking the time to answer. M.K. : I studied art at school so I am familiar with all the greats... but as for living in a painting it would be toss up between the two: Edvard Munch's the Scream or Dali's Persistence of Memory. I think living in Munch's paintingmay be too painful, so let's stock to Dali's!For methe painting evokes a sense of spaceand freethinking. It kind of says a lot about me too in a way. I'm someone who is independent in my work and I love being this way. I like the space to be creative and freethinking. Dali was a surrealist, which again exudes thinking out of the box and with a dreamy quality. Nothing is impossible if you think out of the box and dreams do come true if you guve yourself the chance... I'm a perfect example. So yeah... Persistence of Memory is the one for me! M.K. : Again this is a tough choice... As a fashion photographer, my choice would be based on fashion and nothing else. I would love to have lived as a wealthy person in Elizabethan England. The ornateness and detail in the Queen's clothing back then was just incredible. If I could go back in time with my camera I'd be Queen Elisabeth the 1st personal photographer. I would most definitively marvel on a daily basis at what she'd be wearing and photograph it all! M.K. : Well my parents hit their twenties in the 1960's. so in particular, my father kept a pair of bell-bottom jeans and this really cool green leather jascket with wide lapels and pleats down the front. I actually wore this jacket in my twenties too. It felt amazing wearing a personal piece of history every time I went out in it. M.K. : There's only one scent for me... and that is freshly cut grass. Growing up in South Africa and in a sunny climate, the smell of freshly cut grass reminds me as young 6-7 years old, lying on a freshly cut lawn, next to our pool, staring up at the fluffy white clouds. I photograph them a lot!! HOB: When do you feel like you're on holidays? M.K. : I'm not one who relaxes easily so it normally takes me a good week to wind down. It doesn't really matter where I am or what I'm doing. I normally take one holiday a year and it's usually around 4 to 5 weeks. So I do have time to wind down before I start enjoying myself. M.K. : I'm too partial to camels to be honest, but if I had to choose to bring a designer with me on a camel ride, it would be Alexander McQueen... assuming he was still alive of course!! I'd pick his brains on his designs and work, and of course convince him to let me do a shoot for one of his up coming collections! I'd obviously give him the faster camel so he could beat me in a race... make him feel good and then of course I'd get the job! M.K. : Believe it or not I spent 2 years in culinary school! I had a good all round education, learning to prepare a large array of food. I guess looking back one of my favourite things to make, or rather bake a rich vanilla, caramel and walnut cake. I used to make it a lot back in the days, but not so much anymore! Food has quite a big role in my life as I do a lot of food photography for some major hotels and restaurants in Dubai. d) Respect everyone and everything around you. These are kind of the things I live by in my work and play on a daily basis, and if I had to give advice to my son, this is what I would tell him. M.K. : I'm not much of a reader... I find my time consumed by shooting, editing, researching and coming up with ideas for my online creative magazine (X-Pose Magazine). Finding time to read is a luxury! However if I look back at the books that I’ve read in my past, from youth to adulthood, one book that stands out to me is a book written by a Gothic writer called Poppy Z Bright called Lost Souls. I wouldn’t say it changed my life, but it was indicative of where I was in my life creatively, musically within the Gothic lifestyle. M.K. : I love films and everything about it. It’s an extension of photography and it’s only now later in my career as a photographer that I’m truly beginning to understand and appreciate film. When most people are looking at the story line, I’m looking at camera angles, locations and scenery, wardrobe, hair and make up. The entertainment level of course is also important to me. When it comes to film as a genre, it’s impossible to separate tv and movies except by their length. I’m a huge mini series fan so if you don’t mind I’ll give you my favorite film of all time as well as tv series. Film: The Cell - TV series: Game of Thrones. HOB: Three favorite spots in Dubai? M.K. : I’m no longer much of a night owl, so some of my favorite spots are not what you would expect. 1. One of my favs is Kinokuniya Book Store. I can spend hours there looking through various books of interest, from fashion to music, photography, Manga (Japanese art and stories), Graphic novels and more! 2. Another favorite place is any of the More Café’s in Dubai. Perfect for good food, great coffee and free internet for working quietly on my own or with a client for a meeting! 3. Lastly if I like to hang outdoors, I do love going to the beach for a bit of sun and stand up paddle boarding. Kite Beach here in Dubai rents them out and it’s great fun! I spy with my little eye... Cartier's Paris Nouvelle Vague Collection. Cartier is presenting a new collection named Paris Nouvelle Vague. I worked a little bit with Cartier in Paris and I think I spotted more Trinity rings during these few months than I will ever do for the rest of my life. As much as I love the idea of a classical piece, I am proud I resisted the three golds sirens (my life is tough indeed...). Obviously, inevitably, everytime I hear Cartier, I think Trinity or Love. Therefore I was more than happy to receive Cartier's invite to the preview of their new collection! Something new! Something new and something I liked. A lot. The collection comprises 7 different inspirations that represent 7 different parisian women and 7 different neighborhoods in Paris. I can easily realte to that: depending of where you are in Paris, you find yourself moving differently, having different discussions, going through different moods. If you look at my categories ("pick a cookie"), I tend to feel different in each city or country: "chic in Dubai", "classy in Paris", "vintage in London"... I guess Cartier and I have more in common that I thought. So here are Cartier's moods: "Mischievous in the Tuileries", "Voluptuous at Opera", "Impish in the Luxembourg Park", "Emancipated in Trocadero", "Sparkling at the Moulin Rouge", "Delicate in a Paris street", "Glamourous at the Seine bank". 7 moods, 7 neighborhood, 7 inspirations, 7 styles. More information on the collection here.